Step 1: Launch Kernel for PST Split software. 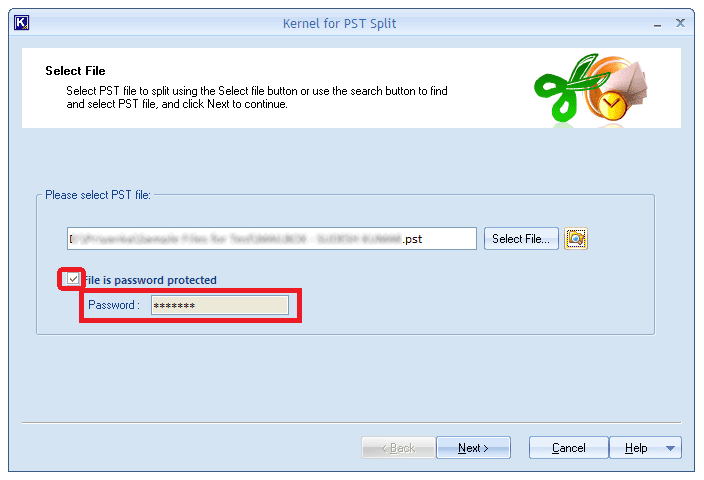 Step 2: Specify the PST file you want to split. If it is Password-Protected, check the box preceding File is password protected and enter the password in the text box. Click Next. Step 3: Opt for Split PST file based on date from the listed options in Select Split Option window. Step 4: Specify the date range for which you want to part the selected PST. Step 5: Select the destination to save the outlook PST files. Step 6: Lastly, you can view the progress of the splitting process. You can see the location of the PST files as well. Once the process is complete, click Finish to exit the application. 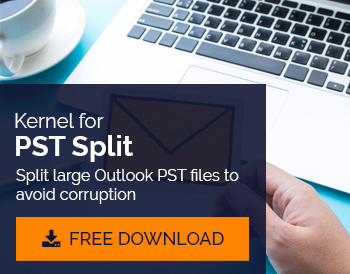 Kernel for PST Split is designed to split PST files and to avoid errors due to large size of PST files. With its option to perform split according to the date range, you can store your PST data for a desired time period separately. This software is integrated with two options to sort files date wise. You can either select a range from the drop-down i.e. 1 week, 2 months, 1 year, etc. or can define a date range manually by selecting the dates. The straightforward interface of this tool makes the process easier even if you aren’t a techie. How to Overcome from Oversized PST File Issue?